A balancing of the rights of authors and consumers, the re-introduction of a private copying exception, a remixing permission and a new regulatory agency for copyright issues are among the core points the Brazilian Ministry of Culture has planned for the new copyright law. But at the Third Conference on Copyright and the Public Interest in São Paulo one month ago, the Ministry emphasized that the bits and pieces shown to the audience were not from an actual law draft („anteprojeto“) but only a preliminary proposal for formulating such a draft. The bill has still not been published to date. The delay in releasing the bill for public consultation now threatens the work of more than two years on the reform. The law reform process was initiated in 2005 when a National Conference on Culture proposed to promote a broad public debate on copyright. In December 2007 when the former Minister Gilberto Gil was still in office, the Ministry of Culture (MinC) launched the National Forum on Copyright. Since then one international and four national conferences, a number of regional discussions and sectoral meetings with representatives from various branches of culture industry as well as civil society were held. The MinC summed up these debates in a paper that formed the vantage point of the Third Conference on Copyright and the Public Interest held on 9 and 10 November in the Centro Fecomércio in São Paulo. This paper identifies three fundamental imbalances that require changes to the current Brazilian Copyright Law 9.610 as amended in 1998 (English translation). The first is an imbalance in the relationship between creators and investors, characterized by total buy-out contracts especially in international trade. An adapted copyright law, says the Ministry’s paper, would stimulate new business models and „facilitate projecting the richness of Brazilian cultural production internationally for the benefit of authors, in a more autonomous form not subject to the logic of large business groups that hold a global hegemony.“ Strengthening cultural diversity is indeed one of the central themes of the whole project. The third issue the paper raises is the inadequate role of the state in the copyright field. The law reform of 1998 repealed the National Copyright Council which left the Brazilian state without any means of public policy planing and protection of the national interests in this area. It was argued in this period that copyrights are solely a matter of private interests, in practice legitimizing the unchecked outcomes of asymmetric disputes between the actors in this industry. There was no institutional oversight. The government actions that did exist were driven more by international pressure than by the needs of domestic creators and rights holders. In the absence of a capable partner in the executive sphere this frequently led to law suits. Because of these imbalances the Ministry proposes to extend the first article of the copyright law to include the following language: This law is to „make explicit that there must be a balance between the constitutional provisions of copyright protection and the guarantee of full enjoyment of cultural rights and other fundamental rights and the promotion of national development;“ and it is to „strive to harmonize copyright protection with the principles and rules of free enterprise, protection of competition and consumer protection.“ If passed by the Brazilian parliament this would be the first copyright law that I know of that makes balancing of copyright with access and usage rights and consumer protection its declared goal. But until passage of the bill there is still a long way to go. 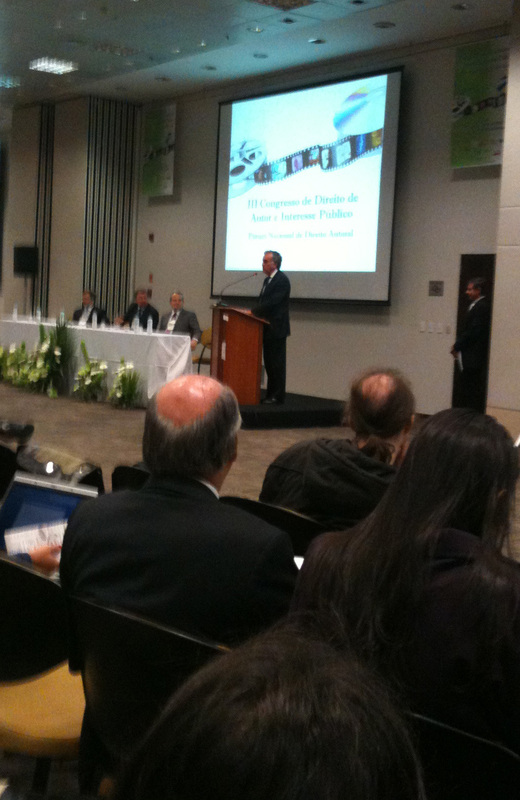 The copyright conference organised by the law department of the Federal University of Santa Catarina (UFSC) was to be the culmination of the two-year process with the publication of the draft law. This is to be followed by a public consultation period of 45 days, leading to a final revision by the Ministry before the bill is then introduced in Parliament. An open public debate on a ministerial draft law is itself a novelty in Brazilian law making. The consultation procedure is currently being used for the first time with respect to another important Brazilian law project by the Ministry of Justice, the Internet Bill of Rights (Marco Civil de Internet). At the conference, Minister of Culture Juca Ferreira emphasised that while copyright is an area of private activity it does take place within rules in the public interest. Therefore the reform process requires a maximum of transparency and openness for democratic participation. Alas, the Ministry did not publish the actual draft law (announcin the non-publication only one day before the conference on the Ministry’s twitter channel). It only revealed the respective articles of its working draft to the reporters and respondents of the twelve panels of the conference which dealt with the different sections of the copyright law, like the economic and moral rights of authors, exceptions and limitations, collecting societies and sanctions. Panel reporters noted the awkwardness of having to comment on a set of articles without knowing their context within the complete bill. At the very end of the conference the MinC announced via the event’s twitter channel that it will make the full draft law available for public consultation within 30 days. Later it was learned that yet another ongoing law reform concerning public funding of culture is fully occupying the Culture Ministry’s staff, and that as soon as this is concluded they will continue work on the copyright law. However, this delay threatens the chances of the whole reform. Soon campaigning for the elections in 2010 will be politicians‘ top priority. If outgoing President Lula does not manage to transfer his overwhelming approval rates of more than 80 percent to his successor in the Workers Party (PT), a new conservative government is certain to start the copyright law reform from scratch or even follow industry arguments that no reform is needed at all. The constructive work of more than two years would be lost. The anteprojeto (draft law) could turn into an anti-project. Addressing this danger, there was a protest action by civil society at the conference demanding the immediate release of the draft law and the start of the public consultation. What is known about the Ministry’s plans so far is moving Brazil’s copyright law in the right direction, even if in respect to areas like education and the online realm not far enough. In line with the analysis that copyrights and usage rights of citizens are out of balance, the MinC proposes to introduce some important new exceptions and to clarify the existing ones to make them more easily comprehensible to citizens. The previous copyright law in force since 1973 contained a private copying exception that the 1998 reform significantly reduced. Since as many copying devices and empty media are sold in Brazil as anywhere else, a prohibition is quite out of synch with reality. Thus the Ministry plans to permit „private copying, or reproduction by any means or process of any work legitimately acquired, if made in one copy and by the copyist, for his private and noncommercial use.“ In addition, copies for purposes of portability and interoperability of works, i.e. „for making them perceivable on devices, computer programmes and peripherals other than those for which the work was originally intended,“ shall be permitted without limitation as to the number of copies. This would legalise the very common practice of ripping a music CD onto a PC and then copying it to an MP3 player or mobile phone. Furthermore, literary works, phonogrammes and audiovisual works that are no longer available for sale are to be reproducible for non-commercial purposes. For the commercial offering of orphaned works and out-of-print works the paper suggests a compulsory license subject to compensation. A quotation exception, mandatory under the Berne Convention, is to permit „the use in any work of short extracts from existing works of any kind, or of an entire work of visual art.“ Clipping services reproducing selected articles from periodicals shall be permitted for the first time, as long as they are non-commercial and their circulation is restricted to members of an association, union or other organization. An exception to the benefit of disabled persons is to be introduced, but restricted to the visually impaired. „The reproduction necessary for conservation, preservation and archiving of any work, for non-commercial purposes, if carried out by libraries, archives, museums, film archives and other museum institutions,“ is to be permitted. Since this exception expressly refers to any kind of work it would remove the obstacles to preserving computer games and other kinds of interactive works that still exist in many jurisdictions. Two other proposed exceptions permit the theatrical performance, recitation or declamation, the visual display and musical performance of works, provided they have no profit intention and the public can attend free of charge and they serve educational purposes, the purpose of cultural diffusion, opinion forming and debate, or they take place in recognized cinema associations, schools or churches. Finally, the Ministry proposes a general clause that would permit „other special cases of reproduction, distribution and communication to the public of protected works for educational, instructional, informational or research purposes or for use as a creative resource, when done to the extent required to achieve the purpose and without affecting the normal exploitation of the reproduced work or unreasonably prejudicing the legitimate interests of its authors.“ This general exception was likened to the US American fair use provision, reined in by the language of the Berne three-step test. Not only would it extend the manoeuvring space for education and research, the permission of use „as a creative resource“ would also extend the legal ground for remixing, that has become a mass practice in Web 2.0 culture, beyond the existing quotation exception — a step that many international copyright law scholars have long called for. All these uses of protected works are to be permitted without authorization by the owners and without payment of a levy. This was also the case for the private copying exception prior to its termination in 1998. But, adds the discussion paper by the Ministry, it now proposes to introduce a levy on private copying by means of a special law, and it announced that it will soon start a full debate on this subject. No exception is proposed for the pressing issue of peer-to-peer file-sharing. Guilherme Carboni, copyright specialist at the private university FAAP in São Paulo and one of the rapporteurs on exceptions and limitations at the conference, did point out that solutions are being discussed abroad but thought that they would be difficult to achieve in Brazil at this point. The MinC, I was told, consciously kept the issue out of this draft arguing that a solution can not be found in national legislation but should be sought in the international arena. But at WIPO file-sharing is not on the agenda, leaving the initiative to proponents of extremist models like the digital death sentence. Thus it seems that the MinC is taking a head-in-the-sand stance rather than pro-actively striking a balance between authors‘ rights and users‘ rights on this important digital challenge. The imbalance between creators and exploiters is the first that the MinC emphasizes in its analysis but the means it suggests to rectify it seem rather feeble. It proposes a provision that states „that contracting parties should observe … the principles of honesty and good faith, and cooperate to fulfil the social function of the contract and the completion of its purpose and the common expectations and those of each of the parties.“ Furthermore it suggests that either party may request the revision or termination of a copyright contract, for excessive financial burden or when one party accrues extreme advantages due to special and unforeseen events. Thus the Ministry plans to significantly strengthen the position of authors vis-à-vis the exploiters of their works even if it falls short of introducing an entitlement of authors to an adequate remuneration for each commercial use made of their works, as did the German legislature in its 2002 copyright law reform. Remarkably, in line with demands by Lawrence Lessig and other law scholars, it does propose to introduce a registration requirement for the sales of works, not as a condition for the granting of copyright protection but in order to enable effective information about ownership. But even the mention of general principles of fairness and honesty met with strong criticism by the rapporteur and her respondent on this conference panel. According to lawyer Eliane Abrão, copyright law does not need to be changed. Given freedom of contract all is well. She went so far as to say that copyright is not for amateurs, calling MinC staff amateurs. Like most music collecting societies in Europe, ECAD also prohibits its members to release their works under Creative Commons licenses. In 2007 the director of the Brazilian composers association, Fernando Brant, led a campaign by personally attacking then-Minister of Culture Gilberto Gil in a series of newspaper articles for his support of Creative Commons. The latter refers to a conflict that escalated in 2004. The Brazilian Reprographic Rights Association (ABDR), acting on behalf of publishers, strives to stop photocopying altogether. Until 1998 private copying was permitted without a levy payment. The copyright law reform of that year reduced the exception to a single copy of „small excerpts,“ provided it is made by the copying party for private and non-commercial purposes (Art. 49 II of Statute 9.610/98). In the aftermath ABDR campaigned for its interpretation that „small excerpts“ are no more than one or two pages of a book and that copy-shops that take a fee for their service are outside the scope of the permission. 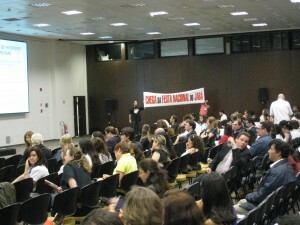 At the beginning of the new century, an agreement on a fee per copy was concluded between publishers and copy-shops, but ABDR unilaterally broke it and started a police campaign against „piracy.“ In 2004 it started to sue leading educational institutions like the University of São Paulo (USP), the Pontifical Catholic University of São Paulo (PUC-SP) and the University of the State of Rio de Janeiro (UERJ) for allegedly facilitating copyright infringements, as well as student organisations running copy-shops like the one at the Fundação Getulio Vargas (FGV) Business School in São Paulo. In 2005 alone ABDR made 158 requests for search and seizure of copies of books in universities. In response students and academics in São Paulo and Rio started the movement Copiar Livro é Direito! (Copying Books is a Right!). They argued that prices, especially for textbooks are prohibitively high while commercial availability is low. A study by the Research Group on Public Policies for Access to Information (GPOPAI) at USP showes that the majority of students at that university had to pay a full month’s income of their entire family or more in order to buy the books required for one school year. Furthermore it found that one third of the books on the mandatory reading list for undergraduate courses at 36 universities were out of print. For the curriculum of the FGV Business School even half of the mandatory books were found to be out of print. Sharing the few library copies is not feasible without photocopying. Solving this crisis by legalising private copying is therefore one of the most urgent tasks the MinC has taken on. Representatives from academia demand that at least for educational purposes this should not require a levy payment, arguing that many of the relevant works were created with public funding and should be available for educational uses in the public interest. The MinC, as mentioned before, sees a need for a levy but its reference to a special bill and public debate indicates that it wants to keep this issue separate from the current copyright bill. Introducing a levy on photocopying would then require encouraging the establishment of collective management. Since Brazil is one of the few countries where there is no public oversight of collecting societies — leading to a situation in which the ill-reputed ECAD has given a bad name to collective management in general –, the Ministry’s plan to encourage at least two new collecting societies is tied to the proposal for a new regulatory agency. Such agencies are well-established in many areas of private enterprise, e.g. ANATEL for the telecommunications industry, the Agência Nacional de Cinema (ANCINE) for the audiovisual sector, and also the unions need need to be approved by the Ministry of Labor and Employment. The paper thus proposes the creation of an Instituto Brasileiro de Direito Autoral (IBDA) under the Ministry of Culture that will „supervise, regulate and promote the collective administration of rights, provide administrative dispute mediation and arbitration in this area, organize the registration of works, provide the State with the technical capacity to act in the interests of the country in the international arena and encourage the dissemination of copyrights.“ The Ministry expresses its belief that it is necessary to promote and stimulate the creation of other associations of authors and publishers in addition to those of audiovisual and textual works. In order to ensure fair representation, an effective and transparent management of the rights entrusted to them and compliance with the rules of collection and distribution of levies, including obligations under international agreements, the collective management organisations will have to seek approval by the new IBDA. Transforming ECAD to abide by these rules will certainly be a major undertaking. Establishing a sound basis for collective management will be an important step for expanding its application to the digital realm. A comprehensive registry of works, today partially organised by the National Library, will not only facilitate trade in copyrights but also legal certainty with respect to orphaned works, free-licensed works and to works in the public domain. Administrative dispute arbitration entails the chance of reducing the number of court cases. 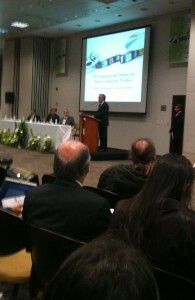 In short, the IBDA promises to be a crucial instrument in improving the copyright environment of Brazil. The final section of the Copyright Law and the final panel of the conference as well deal with sanctions. Here the MinC presented two remarkable proposals concerning DRM and payola. Even though Brazil has not signed the WIPO Copyright Treaty of 1996, in its 1998 reform it nevertheless did implement nearly literally the protection of DRM established there. The MinC now proposes to keep the current prohibition of the circumvention of Technical Protection Measures (Art. 107) in place, however, to complement it with a prohibition of the abuse of TPMs by impeding lawful uses in any way. Just as in the Spanish copyright law, companies that use DRM would have to make them respect user rights. Those who the analysis found to be at the top end of the unbalanced copyright see-saw are naturally inclined to conservatism. Thus the most vociferous publisher associations and the music collecting society ECAD made it clear from the beginning of the reform process that they oppose any changes to the current copyright law. At the copyright conference their voices were rarely heard. This might be because they are so sure of themselves that they don’t find such a public debate worth while. They certainly have other channels to influence legislation, one of which is the press. On the morning of the first day of the conference one could read in the newspapers that the President of the Brazilian Copyright Association (ABDA), José Carlos Aguiar, complained that „authors were not consulted and the emphasis of the reform is on the weakening of copyright.“ (Folha de S. Paulo, 9.11.2009) The same article cites Juca Novaes from the Associação Brasileira de Música e Artes (Abramus) as saying that the reform is a „top-down measure“. Given the great effort of the Ministry to organise a two-year-long open debate with countless opportunities for input by authors and industry this is simply ridiculous. Novaes also formulated one of the main lines of attack against the law project, calling it a „nationalization of copyright,“ positing the public oversight of the workings of ECAD by the Copyright Institute as something akin to communism. In fact, the IBDA only re-creates the National Copyright Council (CNDA) that was abolished by the 1998 reform. Another influential newspaper, the Estadão (9.11.2009), titled „Copyright turns into battlefield,“ citing Roberto Mello, the director of Abramus, as accusing the bill of being “statist and interventionist“ and declaring „war“ on the proposal. The large content providers like Internet portals, ISPs and broadcasters, said Mello, are not willing to pay for the use of works. These huge corporate interests will fight to avoid paying four or five percent of the value of the content to collecting societies. The attacks thus underscore how much such public oversight is needed. Elaine de Moura, lawyer of another publishers‘ association, rightly criticised the lack of full access to the draft law, making a deeper analysis of the proposals impossible. At the same time she warned against „excessive references“ to constitutional rights and to the Code of Consumer Protection (CDC), since their compliance is anyway guaranteed by all laws (Goldenlight.biz, 14.11.2009). USP Professor Antonio Morato, quoted in the same article, sees the Ministry’s proposal as a „suppression of the rights of authors.“ What is needed is public policies to promote culture, he said, whereas the copyright law does not need to be changed. 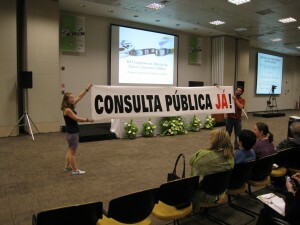 That the organisations resisting change express opinions supposedly on behalf of all authors, without consulting the diversity of opinions of the artistic community, is one of the main points of criticism of the movement Música Para Baixar (MPB, „Music for Download“ and a play on the common term „Música Popular Brasileira“). In a statement handed out at the conference the indie label musicians that make up MPB specifically highlight the corruptness of the current music system: While every community radio station has to pay licensing fees to ECAD, none of the local artists they play receive any money but only the authors of the 600 most-played songs. And these are most-played because labels pay stations to do so. Prohibiting jabá (payola) and controlling ECAD through the proposed Brazilian Institute of Copyright is therefore the most urgent task for MPB in order to increase cultural diversity and the possibility of income generation for a greater number of people involved in the music production chain. The Composers‘ Unions of the States of Rio de Janeiro and Rio Grande do Sul also support the reform, recalling the recent parliamentary investigation in São Paulo of ECAD. 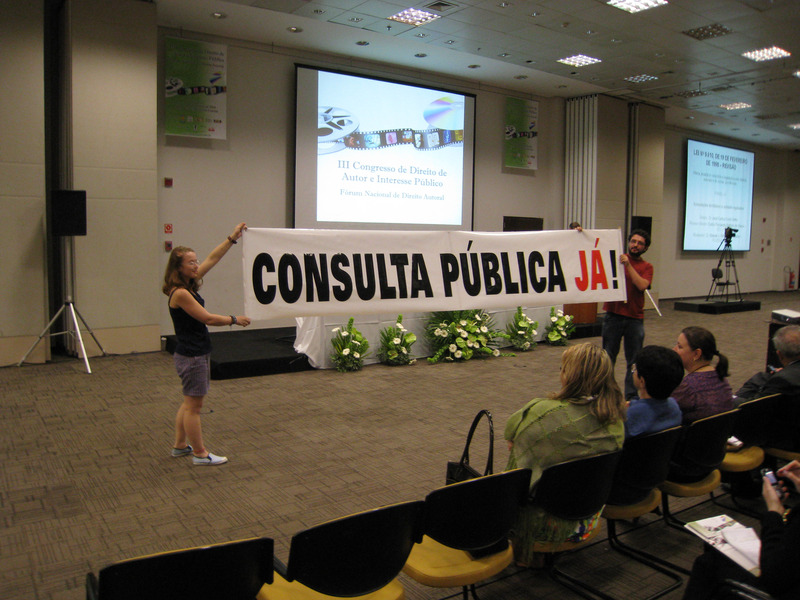 Already at the end of 2008 an initiative by academics, artists, writers, teachers, editors and members of civil society issued the Carta of São Paulo on Access to Cultural Goods that was also distributed at the conference. For them as well, it is evident that the digital revolution necessitates a copyright reform in order to establish a new balance between authors and exploiters, and between private interests and public interests. The Carta’s demands include the right to private copying and other non-commercial uses, to reproductions for format shifting and preservation, of accesses to orphan works, the reduction of the copyright term from 70 to 50 years after the death of the author, a limitation of the assignment of exclusive rights to five years strengthening authors‘ control over their works, and checks on DRM and on collecting societies. Many if not all of these demands for adequate responses to urgent challenges of the digital age seem to be echoed in the Ministry of Culture’s plans. How exactly nobody knows, until the Ministry finally publishes its draft law and the final round of debate on a balanced copyright for the 21st century can begin. The clock is ticking on the possible success of the reform. Much is at stake — for the future of Brazilian culture, for other countries in Latin America who look to Brazil as a role model and for the world. Christmas has passed and the law proposal is still not published. According to the latest rumors from within the Ministry of Culture it now plans to release it in the second half of January.